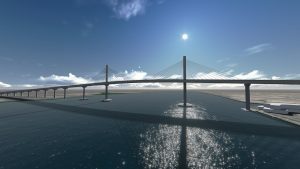 The “Mohammed al Baquir Bridge” has a total length of 1,188m and is composed of a central cable-stayed bridge of 288m with spans of 69m + 150m + 69m and two approach viaducts supported by 22 piers of varying heights and two abutments. 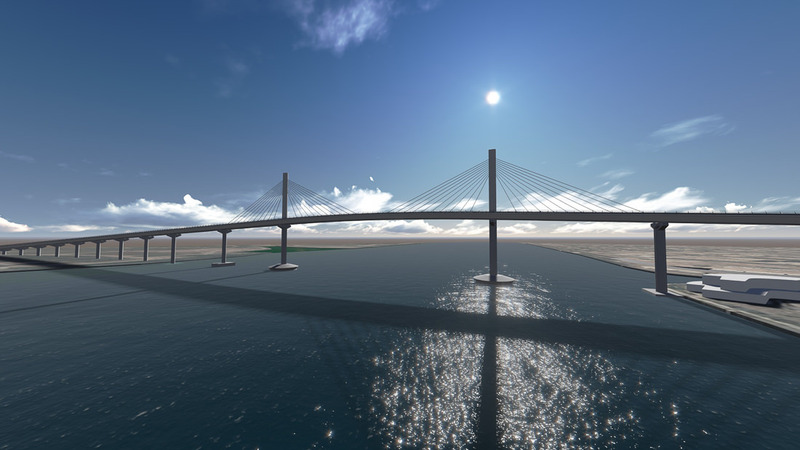 The total weight of the structure is circa 5,400 tons. The 8 hollow central piers have shaped sections, while the lower sections of the other 14 piers are of a hollowed circular form. The bridge decking is in steel-reinforced concrete composite, and the pylons are made of steel. Abutments and foundation plinths To cast the two abutments and foundation plinths the standard P300 formwork system was chosen; an enclosure of pile sheeting bordered the riverbed for the foundations of the central pillars. 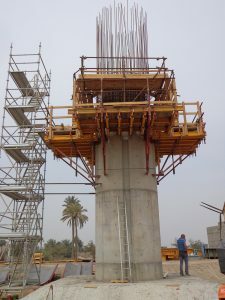 The modular P300 formwork system with climbing brackets was also chosen to cast the outer part of the 4 central shaped pillars, which have a constant dimension (5x3.8m, heights 23.76m to 26,76m); whereas a special formwork was produced and combined with the P300 standard to cast the four tapering central piers (base dimension 7.80x4.10m and 6x3.8m in size, summit dimension 5.0x4.10m and 5.0x3.80m, heights 27.78m to 29.86m). on. 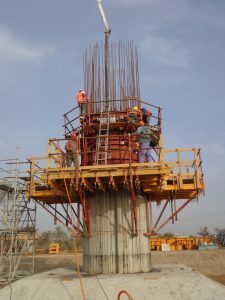 Once pulled by the crane hook, the 4 stripping conical corners, come off and the diameter of the formwork narrows allowing all the formwork to be lifted as a whole. MP service climbing towerswere supplied for all high access work. 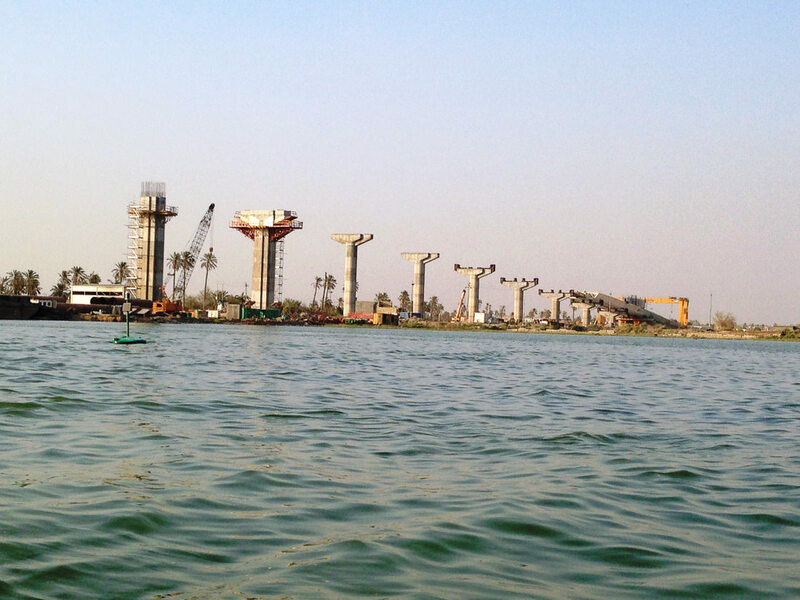 To make the 14 hollow circular shaped piers, 2.83x 2.98m size with variable heights (7.42m to 22.04m), the Pilosio technical office developed a system of special steel formworks connected to the external climbing brackets. 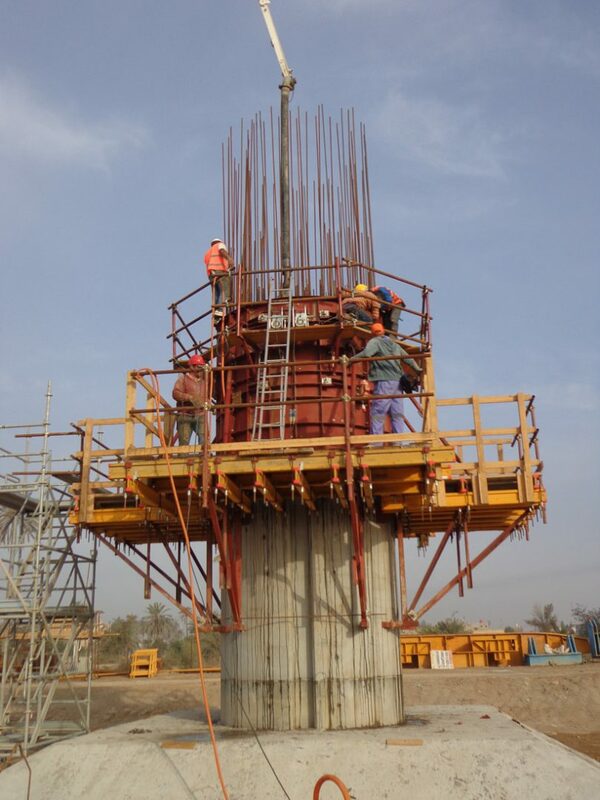 A further supply of internal circular steel formworks with quick dismantling system and mobile platform were also made to measure to simplify the casting. 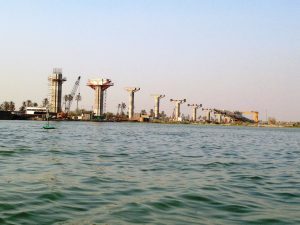 The particularity lies in the fact that the working and supporting structure for casting is positioned at height and anchored to the shaft of the pier, rather than a supporting structure created from the ground. 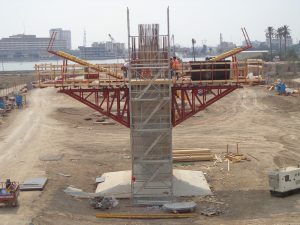 Three triangular cantilever supporting frames anchored to the pier shaft support the working platform for the P300 formwork that holds the external piercups, and for the MAXIMIX system that makes the stopends and the base of the piercup overhangs. Metal inverses were used to create recesses that correspond to the shaft recesses. Pilosio provided two MP service staircase towers for access at height during the assembly of the cables. A base of brackets fixed to the pylons enabled a further MP tower to be mounted parallel to the climbing tower, with work decks every two meters up to the summit so allowing the workers access to all the cables.